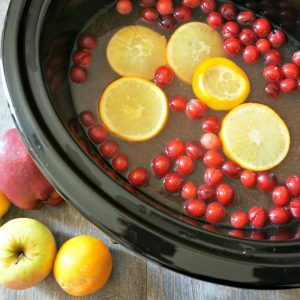 Slow Cooker Mulled Cider: Apple juice, pineapple juice, fresh oranges, and cranberries are spiced with cinnamon, ginger, and nutmeg and simmered together in the slow cooker for a warming, yet refreshing Cranberry Apple Cider. When my entire immediate family gets together at the holidays, there are two drinks that my mom always has prepared: Christmas Tea and Mulled Cider. My mom’s Christmas tea is tea that has been steeped with cranberry juice, pineapple juice, orange juice and sugar. Lots of sugar. The mulled cider is simply a packet of spices and sugars my mom dumps into local apple cider. Both are delicious but both are LOADED with added sugars. And because I desire to have my sugars in the form of holiday cookies (like Triple Chocolate Chip Cookies and Chocolate Covered Peanut Butter Cookies) —I do not want to drink them. But oh how I love both cider and Christmas tea, and decided it was needed for me to combine my two childhood favorites for one delicious mulled cider recipe. This crock-pot spiced cider has the flavors of mulled cider and Christmas Tea, just minus ALL added sugars. The verdict? I served it to my siblings and parents whom devoured it and only stated over and over how delicious it was–ZERO mention that it was not the traditional beverage served. Want to know a budget-friendly tip for making homemade apple cider? Use apple juice!! The apple juice is cooked low and slow with so many other flavors that no one will know it is not cider (although it is absolutely delicious when made with Apple Cider as well. I make Homemade Mulling Spices to save money and to control the quality of ingredients I add to homemade warm cider. Not to mention, when you make your own mulling spices–you leave out all the added sugars and preservatives. Place cinnamon sticks, cloves, allspice, ginger and cloves in a coffee filter. Tie the coffee filter together with butcher twine. This pouch of mulling spices makes it really easy to remove the whole spices before serving mulled cider. Add in pineapple juice, cranberries and orange slices. Nestle the mulling spice bag into the cider. Add in freshly grated nutmeg right to cider. Remove mulling spice bag and serve. You can make this mulled apple cider on the stove instead of the slow cooker if desired. Place apple cider into large stock pan. Bring to a boil and then turning to low and simmer on the stove for 1-2 hours. Use either apple cider or apple juice for this cider. If you do not have whole spices, you can use 1 teaspoon cinnamon, 1/4 teaspoon ground allspice, 1/8 teaspoon ground cloves, 1/4 teaspoon ground nutmeg, and 1/2 teaspoon ground ginger and mix right into your juice or cider in slow cooker. Feel free to use frozen cranberries over fresh cranberries. Keep this spiced cider in the slow cooker on warm for several hours to serve to guests or to enjoy over the day. Refrigerate leftover Mulled Cider for up to 5 days. Reheat by the glass. 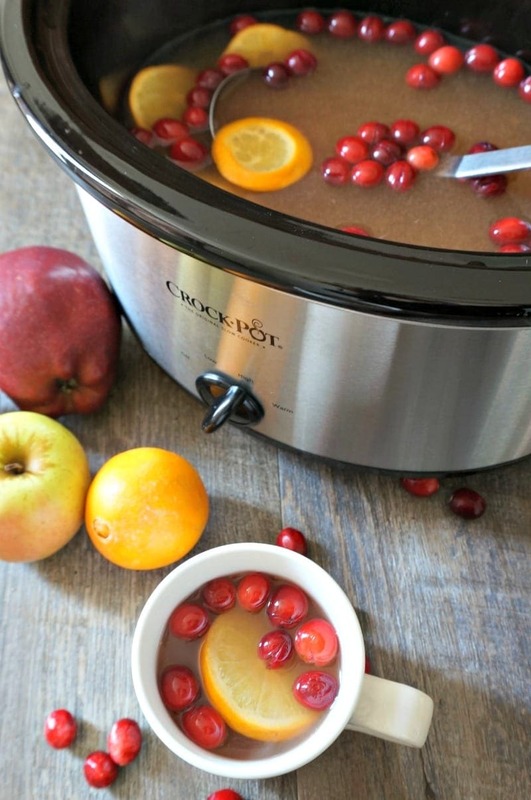 Apple cider is simmered low and slow in the crock pot with citrus and cranberries for a delicious mulled cider recipe. On a coffee filter or piece of cheesecloth, place cinnamon sticks, allspice, cloves, and ginger. Tie off with butcher twine. 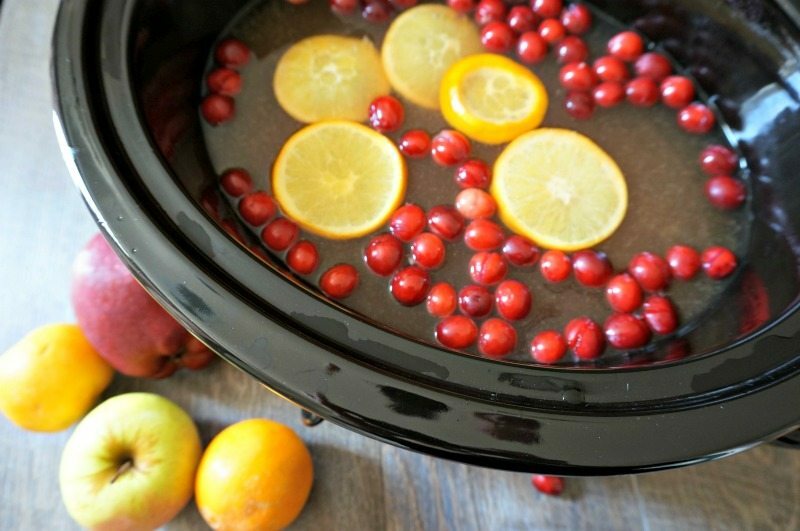 Place juice/cider, pineapple juice, orange slices, cranberries, gated nutmeg and mulling spices in the slow cooker. Cook on low for 4-6 hours or on high for 2-3 hours. Fish out spices and serve. I am always a fan of anything that I can dump into the crockpot and walk away from! I love that this is so festive and delicious for the holiday season! It is the PERFECT drink to entertain with–as like you said, no need to fuss with it! Pinning this mulled cider for later, looks really yummy! Thanks so much Dini! I hope you enjoy!